Our Moggy of the Week is Louise Williams, a Bombay Black cat from Porth in Wales, that was adopted two years ago, from an animal charity, by her mum Sue. Louise was only a year and a half old then and had ended up at the animal charity because she had been abandoned by her previous owners. How sad! Louise had been living at the charity for a number of months when Sue adopted her. After being vetted by the charity, Louise went to live with Sue, and her husband and son. Sue remembered that bringing Louise home was a very special day and that Louise was shy, at first, and seemed wary of men, in particular, but within a few weeks, the entire Williams family had started to gain her trust. “The icing on the cake was when we heard Louise purr for the first time,” Sue recalls. And when we asked how wee Louise is doing now, Sue was happy to report that “she is now a happy, confident little cat who likes nothing better than to sit on our laps and have a stroke. She loves playing, in ‘her’ garden, except when it’s raining! Louise was the name given to Sue’s beautiful black kitty princess by the rescue centre and Sue saw no need to change it. Many new cat parents change their feline’s name but Sue was happy to have Louise as Louise. “Louise is our third black cat. She has a beautiful coat and looks like a little, black lynx. She is my constant companion. She is quite a vocal cat and seems to have a range of different miaows for different occasions – meeting and greeting, asking for food, responding to the door bell, and her ‘cross’ miaow if she thinks we’ve been out too long. Bombay Black cats are indeed a favourite of ours, as we loved our Akira very much and he too was a very loving and loyal companion that knew just when the time was right to come out and find treats on offer. It seems this type of cat is very adept at that. Sue told us that she was sad to hear about Akira passing, but that she had loved the name Akira and didn’t doubt, as with all Bombay Blacks, that Akira was very handsome indeed. 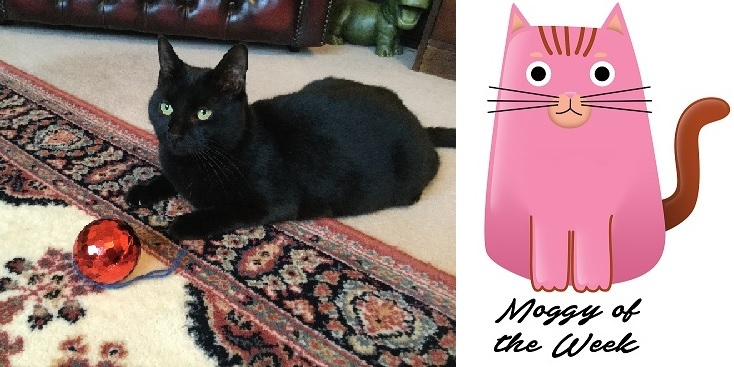 We couldn’t agree more with you Sue and are happy to recognise the sheer gorgeousness of your Louise, our Moggy of the Week.